Sadly, human depravity in the face of sinful temptation is born out again and again in the Scriptures. When Cain is tempted to murder his brother Abel, God warns Cain, “If you do what is right, will you not be accepted? But if you do not do what is right, sin is crouching at your door; it desires to have you, but you must master it” (Genesis 4:7). But Cain does not master his sin. He falls to temptation and kills his brother, Abel. When Israel is led out of their slavery in Egypt and God ushers them into a place of prosperity, God warns the people: “When your herds and flocks grow large and your silver and gold increase and all you have is multiplied, then your heart will become proud and you will forget the LORD your God” (Deuteronomy 8:13-14). God’s warning against forgetting Him proves to be eerily prophetic: “The Israelites did evil in the eyes of the LORD; they forgot the LORD their God” (Judges 3:7). The allurements and enticements of this world are too overwhelming and overburdening for any human to face and defeat. Augustine described powerlessness of humans against temptation and transgression using the Latin phrase, non posse non pecarre, meaning, we are “not able not to sin.” Blessedly, however, Jesus has the remedy for the dourness of our depravity. For He stands up under temptation on our behalf. 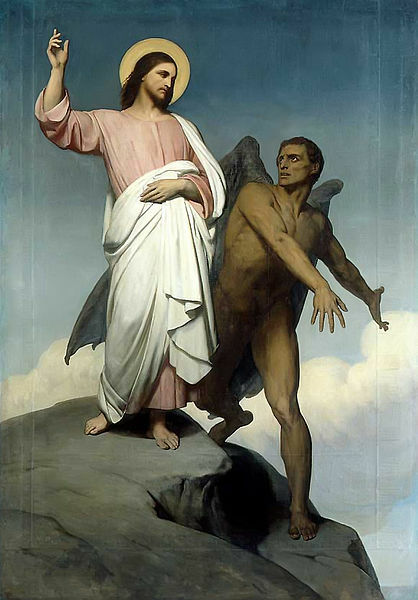 In our text for this past weekend from Matthew 4:1-11, we read how Jesus takes His stand against the devil’s temptations not once, not twice, but three times. Jesus then takes this victory over temptation and gives it to us by means of His death on the cross. The preacher of Hebrews explains: “We do not have a high priest who is unable to sympathize with our weaknesses, but we have one who has been tempted in every way, just as we are – yet was without sin. Let us then approach the throne of grace with confidence, so that we may receive mercy and find grace to help us in our time of need” (Hebrews 4:15-16). Because Jesus stood up under temptation, we have the mercy and grace that we need to help us in our time of temptation. For without God’s mercy and grace, we are powerless to resist the allurements and enticements of this world. So when you are tempted, look not to your own strength, will, or fortitude, but to the cross. For on the cross Christ encounters a final temptation from a crowd of jeerers: “Come down from the cross, if you are the Son of God” (Matthew 27:40)! Interestingly, this phrase – “If you are the Son of God – is the same phrase Satan uses to tempt Jesus in the desert in Matthew 4 (cf. Matthew 4:3, 6). But as with Satan, Christ resists this temptation too. He does not come down from the cross. Instead, He dies to achieve victory over sin. And so on that cross, our victory over temptation is secured. Praise be to God! Entry filed under: ABC Extra. Tags: Alcoholics Anonymous, Ary Scheffer, Augustine, Christ, Christianity, Depravity, non posse non pecarre, Religion, Spirituality, Temptation, Twelve Steps. ABC Extra – Daunting Decisions	Common Question: What’s the deal with the Lutheran doctrine of baptism?